The best height of spacers? What about someone who has too large of a frame and is able to slam the stem, but is left with a short nubby seat post and like a 90 mm stem to make it fit? I say it is okay to have 15-20 mm of spacers under the stem as long as the rest of the bicycle is in proportion and you are using at least a 110-120 mm stem. Also, you may compromise the handling of the bicycle if using a stem length of 100 mm or less with certain models. That perfectly describes my C59 in size 52s with a 12cm stem. A 54s is a bit big but I could run it slammed. For, my next Colnago I could get a 52s H (longer headtube). 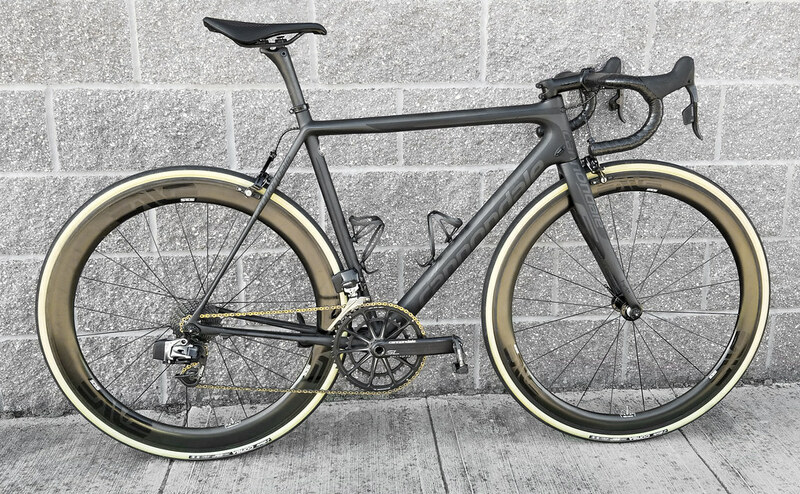 I could run that without spacers but it would have more slope to the top tube which I generally don't like as much as Colnago's gently sloping top tube. Serious question, could the headtube angle and a slammed negative stem ever be incompatible because of clearance issues? I don't think it's likely the AX stem was made with that in mind but was a thought that occurred to me re the shape. No, the AX shape is just due to a bad German joke! I’ll sell you a pair of AX ultra 25T’s and the 200g saved can go towards a more elegant stem (mcfk?). In all seriousness- love your evo, the naked carbon makes it look like a science project! The main reason to slam your stem is to prevent people on the internet from criticizing photographs of your bicycle. Yeah you’re savage like that. Chop and slam before I get the opportunity to advise otherwise. It’s an effective approach to stop your customers from bitching out like I have recently. Sounds like your kind of place! fogman wrote: What about someone who has too large of a frame and is able to slam the stem, but is left with a short nubby seat post and like a 90 mm stem to make it fit? You mean like a certain Evo on this forum? Mr. H throwin' shade. Ironically the people we are making fun of seem to ride the least. I actually dislike the rules from Velominati as they are quite a joke and mainly made for bikers outside the "traditional bike countries" such as France, Netherland, Belgium, Italy, Spain etc...BUT this time I have to agree with them saying that a ""slammed down” stack height is preferable; meaning that the stem is positioned directly on the top race of the headset". It was posted as a joke. If I'm ever quoting Velominati, I'm making a joke. My mantra is more like "what works best is whatever works for you". That being said... I prefer a slammed stem whenever possible and will do so as long as I can do it with a stem rise of 12º or less (-5º on a 73º steerer tube). My Allez Sprint is slammed at 10º rise, whereas my Tarmac has achieved nearly magical perfectly horizontal (< 5º) due to the 10mm longer head tube. If you remember Ryder and his crazy drop . Small frame ,for him ,slammed and plenty of seatpost. Maybe some minor performance differences due to geometry. You see a lot of pros go with smaller frames to get lighter weight and a little stiffer bike, but for 99% of us, it’s not going to make a huge difference. We’re probably better off with a properly fit frame than trying to compensate with 130mm stems. Even though slammed -17° 130mm stems look pretty badass. that evo looks fine to me.. my Parlee is similar.. Shorty stem and seat post... not sure I can slam just yet, but I'm slowly working on it. That’s a decent drop , the clamp makes it look shorter .